Why food intolerance is the real cause of weight gain. 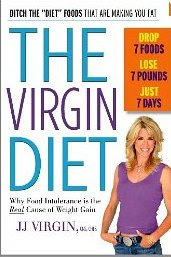 The Virgin Diet: Drop 7 Foods, Lose7 Pounds, in Just 7 Days -and it is correct! allergy or sensitivity, that caused the painful bloating, gurgling, uncomfortable stomach symptoms I’d begun to experience due to an intolerance to eggs. But wait a second? You thought eggs or, egg whites were considered a healthy food? Well, for the most part; they are. But sometimes even “healthy” foods can cause weight gain if your body is intolerant to that food. In her book, JJ explains how consuming some of your favorite foods day in and day out for years, causes your body to begin to build up antibodies for that food, eventually seeing it as a “foreign invader” that it must fight. The symptoms associated with this type of allergic reaction are much more subtle and not usually life-threatening but they can wreak havoc on your weight loss efforts. Symptoms like gas, bloating, stomach pains, aching joints, skin rashes, and headaches are common and often appear 24-48 hours after the “offending” food has been eaten. In her book, JJ explains how these foods can lead to weight loss resistance and then shows you how to identify them, how to avoid them (as they are hidden in things you wouldn’t expect), and how to gradually reintroduce them back into your diet after a specified period of time. After years of helping clients overcome weight loss resistance, JJ has figured out the underlying cause of all those nagging symptoms and weight loss resistance they create. When you’ve done “everything right” and the scale still doesn’t budge, food allergies could be the culprit. Once addressed, you can stop those “healthy” food from holding your health hostage.